CG Says: Toyota’s popular RAV4 compact crossover SUV is redesigned on a new platform for 2019, gaining updated powertrains, a newly available torque-vectoring all-wheel-drive system, and new technology features. The new RAV4 strives for a more rugged look than its predecessor, with beefier design cues and 2.3 inches more ground clearance. The model lineup continues to offer a choice of conventional or Hybrid versions powered by a 2.5-liter 4-cylinder. The engine develops 203 horsepower and is paired with an 8-speed automatic transmission in gas models; Hybrid versions use a CVT automatic transmission and pair the gas engine with an electric motor for a total output of 219 hp. All gas models offer a choice of front-wheel drive or all-wheel drive, save for the off-road-oriented Adventure, which comes standard with AWD. All-wheel drive is also standard on Hybrid models. Toyota’s Safety Sense suite of safety features is standard on all RAV4s, and includes new lane-keep assist and road-sign recognition features, as well as a forward collision warning system with automatic braking and pedestrian detection, adaptive cruise control, lane departure alert with steering assist, and automatic high-beam headlights. Rear cross-traffic alert, blind-spot alert, and a camera rearview mirror display are also available. Other available features include panoramic sunroof, hands-free liftgate, heated/ventilated front seats, 120-volt AC power outlet, and Apple CarPlay smartphone capability—although Android Auto is not available. The old RAV4 was the best seller in the compact-crossover segment, and the new generation builds on its strengths while projecting a “stronger” image. All-around refinement is improved, there’s good passenger and cargo room within the tidy exterior dimensions, and the Hybrid models offer surprisingly peppy acceleration in addition to their better fuel economy. 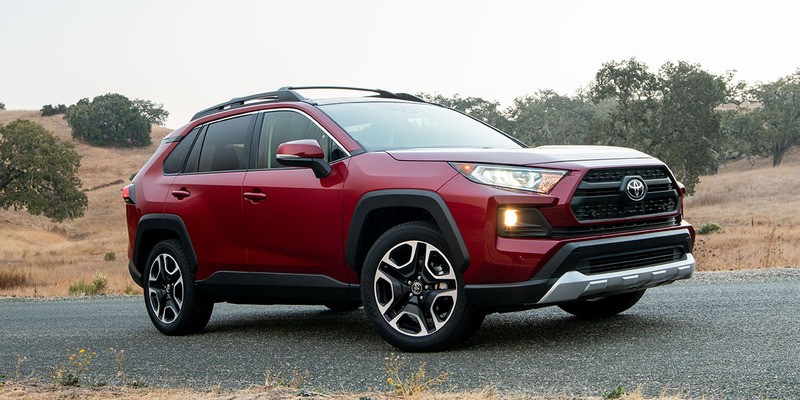 The redesigned 2019 model heightens the RAV4’s already enviable standing in its class.